The dining room table used to be a symbol of family sociability and solidarity. Today, in most cases, it is a relic that gets dusted off for use at Christmas; however, an increasing number of researchers are pushing for parents to reintroduce the family meal, as it has been discovered that it has numerous benefits. The steady decline in family dining clearly reflects the changing nature of interpersonal relationships. With so many families eating separately or in front of the TV, there are bound to be negatives to the situation. Whereas the family meal was the norm two decades ago, it is now the exception and it appears that society is far poorer for this. The world moves so fast and time is something that seems to have become more limited than ever. By setting aside 30 minutes a day to sit around the table and eat, families can reconnect, forge stronger bonds, and learn more about each other. We often miss out on things due to being busy; by eating together, we create a captive audience and can enjoy interacting and catching up. Parents can also quickly pick up on any issues and open channels of communication with their children that may otherwise not be possible. Dining together also improves social skills and gives parents an opportunity to teach their children good manners and etiquette. Sitting down together at bespoke dining tables from designers such as http://simonkohnfurniture.co.uk/our-work/domestic/dining-furniture/ should not be a once-a-year experience. 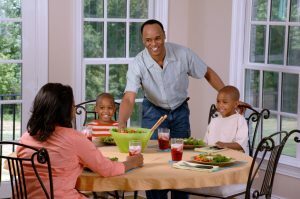 For families, eating together can a form a healthy relationship with food. Parents with difficult teenagers can also identify whether there are any negative behaviours around food, such as an eating disorder. Without the family dinner environment, eating disorders may go unnoticed, as children can hide unhealthy habits more easily. Eating together also creates structure, which is essential for children who need to learn discipline. By scheduling family dinners, children understand structure and start to get used to a routine. It is also a good idea to ban mobile devices at the table and encourage everyone to talk to one another, as valuable social skills can be learnt. Dining together should not go the way of the dinosaur, as it has far too many positives to ignore. Previous Previous post: Amazing Style Hack: How To Dress Well With Little Money?